Purpose: Use this document as a reference for opening and closing cashiering for a business day in ctcLink. 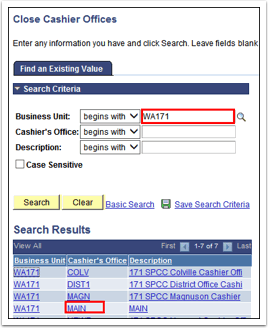 Select the Business Date to open the cashiering office. ctcLink populates the current date however this can be changed if a prior date is required. Click the Open Cashier Office button to open the cashiering office. 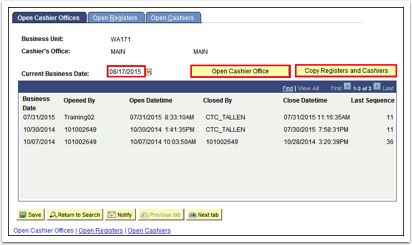 Click the Copy Registers and Cashiers button to copy information regarding the cashiers and registers from one business date to another. Select the Register to open for the business day. If the Copy Registers and Cashiers button was selected, ctcLink copies registers and tender types from the copied business day; but each register needs to be opened. If necessary, enter the Tender Keys assigned to this register. To add multiple tender types, use the (+) to add a row. Click the Open Cashiers tab. Enter, search for, or select the ID of the cashier to open. Click the View All link to see available cashiers that were copied or enter a new one. Select the Register for this cashier to use. Only registers opened on the Open Registers page are available. 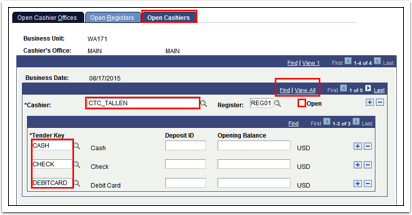 Select Tender Key(s) for the cashier adding multiple by clicking the (+) to add a new row for each tender key. After all cashiers have been added, click the Save button. 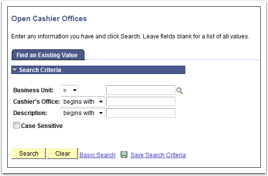 Enter the Business Unit and click Search. Select the Cashier’s Office from the search results. 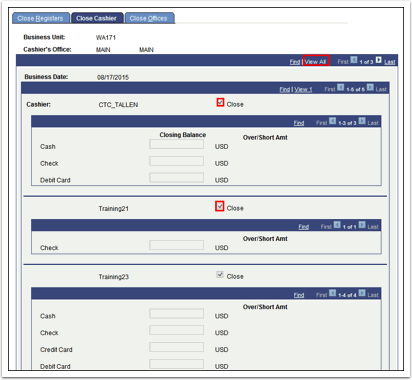 Select the Close check box on the Close Registers tab. Repeat this step if you have multiple registers open. Enter the Closing Balance for each tender. Select the Close check box on the Close Cashier tab. Repeat this step, if you have multiple cashiers open. Click View All to see all cashiers assigned to the register. 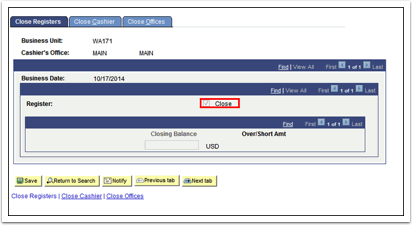 Click the Close button on the Close Offices tab. If any steps have been missed in closing the office, an error message will display. Click OK and correct the error. 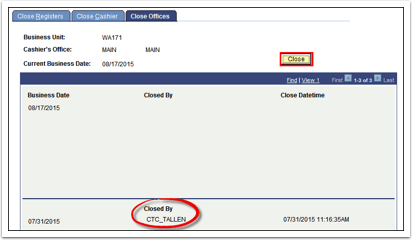 Note that the office indicates who closed and the date/time. Enter the Business Unit and Cashier’s Office. 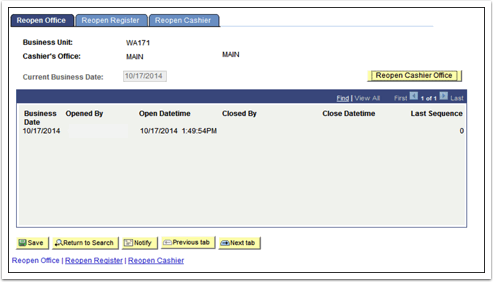 Select the Cashier’s Office from the list and click the Search button to display the Reopen Office page. Enter or select the Business date you want to reopen. Click the Reopen Cashier Office button. Click the Reopen Register tab. 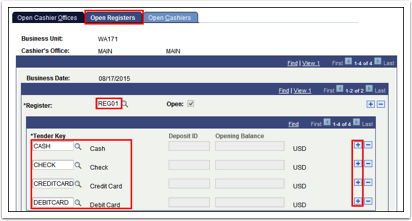 Use the arrow keys to scroll to the appropriate register and click the Open check box for each register to open. Click the Reopen Cashier tab. Use the arrow keys to scroll to the appropriate cashier and click the Open check box on each cashiers to open. Click the Save button to save the information. Make the required corrections that required the cashier's office to be opened for the given business date. Continue with the Close Cashiers Office steps listed previously to complete the process.